When you play in second position on the harmonica, your home note is Draw 2, and the surrounding draw notes form the home chord. However, notes are missing from the scale directly above and below the home note. In earlier times, people played second-position fiddle tunes in the upper register, where those missing notes were available. 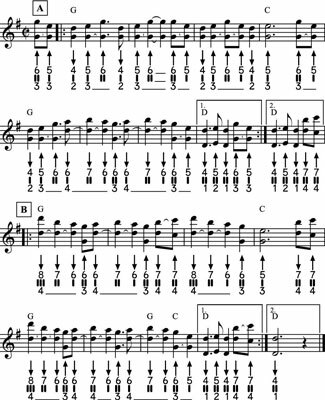 Today, however, the compelling sound of the low draw chord has caused players to learn how to bend notes in Holes 2 and 3 so they can play tunes in the middle and low registers instead. These tunes all require some bending in Holes 2, 3, and 4. Second position gives you a scale called the Mixolydian mode. The seventh note in this scale is flat (lowered), giving it a distinctive sound. Some of these tunes take advantage of the unique qualities of that scale. As a single-note melody, where you play just the top line of the tab. With harmony notes provided by splits, where you place your tongue on the harp and play notes in both the right corner of your mouth (the melody notes) and the left corner to provide a harmony or a drone. Try each tune with single notes and then filling out your sound by adding the exciting, fiddle-like splits. “Over the Waterfall” is an old-time tune played under a variety of names in Ireland, the British Isles, and the American South, where it may have been spread by circus and riverboat performers. It includes the flat note in the second-position scale and isn’t too hard to play. Here, you see it with lots of split intervals. However, if you just play the top note in the tab, you can learn it as a single-note melody. Later, if you decide to tackle learning splits, you can add a new layer to your rendition. Either way, however, you need to get a good command of the Draw 3 bend to play the tune accurately (though you can kind of fake it by playing Draw 3 without bending). 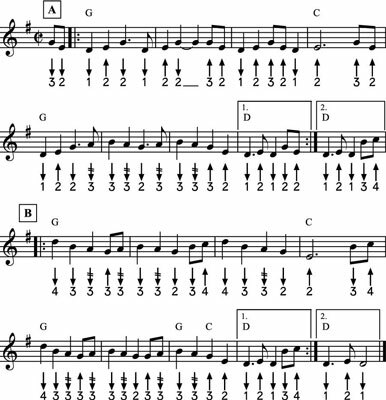 “Over the Waterfall” is usually played in the key of D using a G-harp. Here you play it in G on a C-harp. You can make a nice set, or medley, by playing “Over the Waterfall” and “Angeline the Baker” together. “Angeline the Baker” is one of the most popular old-time and bluegrass tunes in the basic repertoire. It’s an instrumental version of a Stephen Foster song first published in 1850 as “Angelina Baker,” though its melody has changed considerably during its life as a fiddle tune. 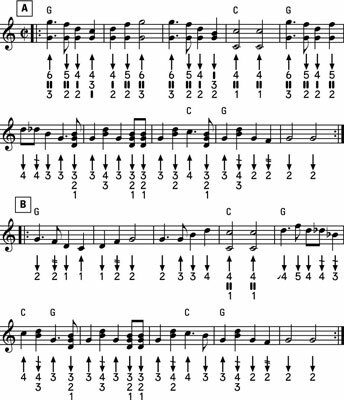 It works so well on harmonica that two versions are shown here, one in the lower part of the harmonica’s range and one in the upper middle part. Splits are notated in the high version of “Angeline the Baker.” As with “Over the Waterfall,” you can learn the tune first by ignoring everything but the top note and then adding the splits when you get good at that technique. 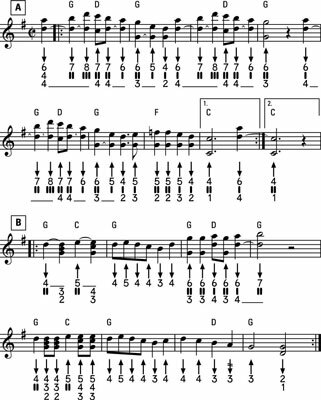 Eventually you’ll be able to play this tune three ways: down low, high with single notes, and high with splits. “Bat Wing Leather” is a companion to “Cluck Old Hen.” Both tunes end their phrases using the pull-off technique. You can play “Cluck Old Hen” at a relaxed tempo and then speed things up a bit as you swing into “Bat Wing Leather.” This tune makes use of splits, but you can play just the melody notes and sound fine.